The Washington Federal Woodburn branch celebrated the company's centennial anniversary on Friday, with complimentary pizza, hotdogs and cake, along with raffle and promo items. The Washington Federal Woodburn branch celebrated the company's centennial anniversary on Friday, with complimentary pizza, hotdogs and cake, along with raffle and promo items. The company, which now has 236 offices in eight states, turned 100 on April 24. 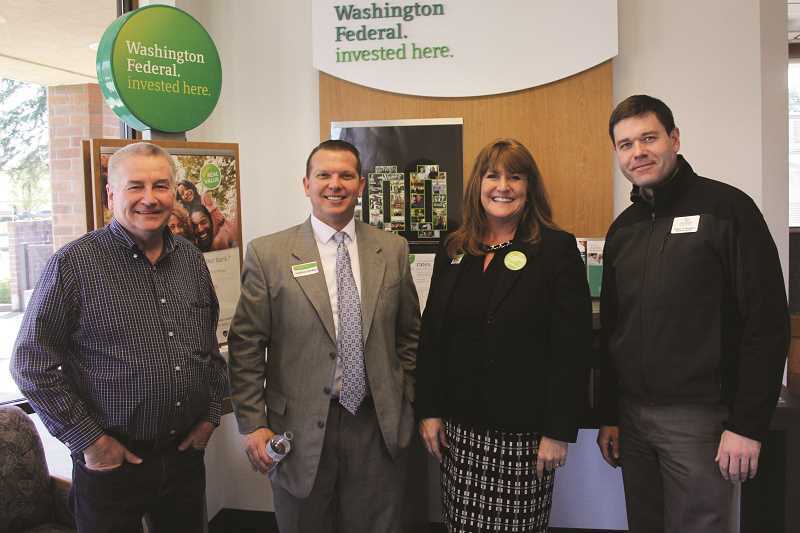 "Throughout changing economies, Washington Federal has been committed to offering sound and client central banking," Woodburn branch manager Jonathon Zolnikov said in a press release. "My team and I are honored to help continue making Woodburn a great place to live and do business." Zolnikov said that it's rare for a business to survive 10 years, let alone 100. "Under half of 1 percent of companies are over 100 years old," Zolnikov said. "For a bank to survive two world wars and two depressions and recessions is a big deal." Washington Federal, based in Seattle, has 49 Oregon branches. The Woodburn branch, located on 999 N. Cascade Drive, opened in 1995. As a whole, the bank has $15 billion in assets and, according to a press release, has one of the highest capital ratios among the nation's 100 largest publicly traded banks. In honor of the centennial, Washington Federal's president and CEO Brent Beardall rang the Nasdaq opening bell in New York on April 24. "We are thrilled to celebrate our first 100 years in business and the partnerships we've established with all of our clients as we've grown from our humble start as a single branch in Ballard, Washington, to become one of the strongest commercial banks in the nation," Beardall said in a press release.